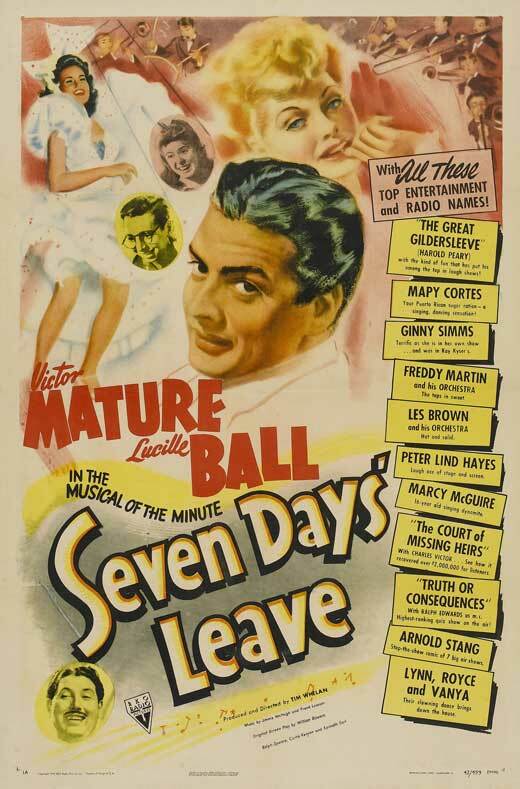 This entry was posted in Musical Monday and tagged Lucille Ball, Musical Monday, Seven Days Leave, Victor Mature by Jnpickens. Bookmark the permalink. That’s Peter Lind Hayes doing the impressions of Barrymore, Colman and Charles Laughton. You might remember him as the plumber in the cult classic The 5,000 Fingers of Dr. T.
I like the movie mostly because of Hal Peary’s presence; he plays The Great Gildersleeve in this, but oddly Gildy’s a lawyer and not a girdle manufacturer/water commissioner like he was on radio. Arnold Stang is also fun to watch – he was sixteen years old when he made this film! I think that was what I liked in the movie best (and should have noted): You got a glimpse into some of the 1940s radio shows. I always enjoy impressions of other actors too for some reason, I guess it’s my guilty pleasure. Hello! You can tell where can I find this movie?